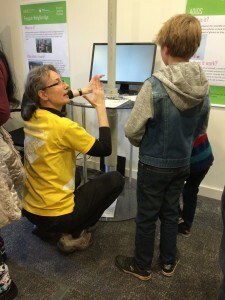 The next generation of innovators were treated to demonstrations from Audio Analytic and the British Antarctic Survey at last week’s Science Festival, and asked to think of new ways to use their world-leading technologies. The i-Teams “What Would You Use THAT For?” competition runs each year at the Institute for Manufacturing, featuring technology-based products from local companies and organisations. Scientists from the British Antarctic Survey showcased the wide range of technologies deployed in the world’s polar regions. This included a penguin weighbridge that automatically measures how much food penguins eat at each meal, a system for using radar to measure the thickness of kilometre-thick sea ice to the nearest millimetre, a wavebuoy to monitor the freezing and melting of sea ice, and the ADIOS system which is deployed into remote regions by air and tracks the movement of glaciers. Sound experts from Audio Analytic Labs demonstrated the science of automatic sound recognition through a three steps hands on experiment. Step one involved playing a string instrument to understand the generation of sound waves. 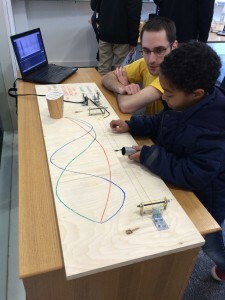 Step two illustrated how computers can capture and represent the composition of sounds, as young experimenters were able to synthesise their own sounds by drawing classical sound wave shapes, simple pictures and even text directly onto the computer screen. Step three was about experimenting with a computer clever enough to recognise the mooing sound of a cow. As a souvenir, the children were invited to make their own “guitar cups” to take home. Visitors were invited to think of how they might use the technologies in new and innovative ways. • Ben Hull, age 6 from William Westley Church of England Primary School, who wanted to turn the ADIOS system into a jet pack. The winners will receive science-based prizes and a special certificate of their award-winning idea. We thank Audio Analytic and the British Antarctic Survey for kindly providing demonstrations for the event, as well as everyone who took the time to enter the competition and provide their fabulous ideas.